Received August 9, 2018; Revised August 13, 2018; Accepted August 13, 2018. Global area of genetically modified crops (GM crops or biotech crops) continued to grow and reached 189.8 million hectares in 2017. Recently, a total of 24 countries approved GM crops for planting and an additional 43 countries formally imported biotech crops for food, feed, and processing, meaning that biotech crops are now commonly accepted in those countries. Although biotech crops should be one of key solutions for the challenge of the global food security which will be caused by population growth and climate change, it is real that there are still some debates to accept biotech crops in many countries including Korea. Because of that, safety assessment is an inevitable step for developing and commercializing GM crops. It is, therefore, very important to understand safety regulation. In addition to considering safety assessment, there are several critical points which we must consider before starting to produce GM crops such as target traits and their market values. In other words, passing safety regulation processing and proving market value should be considered first in the development of GM seeds. National Program for GM Crops (NCGC), one of the Next-Generation BioGreen 21 Programs organized by RDA in South Korea, was established in 2011 to develop biotech crops that will be used in the future to solve problems in our agriculture. To accomplish this mission, the NCGC carried out the exploration of useful functional genes, development of qualified events, and the safety assessment of developed events. This report will present the results of our research to develop useful biotech crops. The global cultivation area of genetically modified crops (GM crops or biotech crops) has increased ~112 fold from 1.7 million hectares in 1996, the first year of commercialization, to 189.8 million hectares in 2017, meaning that GM crops are the fastest adopted crop technology in recent times. In addition, global market value of GM seeds increased annually reached to US$ 17.2 billion in 2017, accounting for more than 30% of the global commercial seed market by 2017 (ISAAA 2017). Therefore, there is a critical need for a technology platform to develop biotech crops to prepare for the expanding future demands. Unlike general seeds, safety assessment and regulatory approval are essential for the commercialization of GM crops. Accordingly, all safety assessment criteria should be considered before the development of GM crops. Unfortunately, many researchers failed to develop commercial GM seeds because they were not well aware of these regulations (Kim et al. 2009; Lee 2011). In addition to considering safety assessment, there are several important criteria considerations to consider before we begin to develop GM crops, such as target traits, market values, and intellectual property rights of genes to be used. Since commercialization of a single GM seed costs at least US$ 15 million and an average of 13 years, researchers have been able to sufficiently verify the abovementioned considerations before or in the early stages of development of GM crops. For this reason, South Korea launched a national research program called the NCGC (the National Center for GM Crops) in 2011 to develop biotech crops that meet the criteria mentioned above and can be used as useful breeding materials for future use. The most of research projects in NCGC were conducted primarily to explore useful functional genes, develop qualified GM events, and assess their safety for future use as a breeding material. To this goal, many research teams from various universities and research institutes have been participated in this program (Park 2014, 2017). The main goal of the NCGC is to establish a technology pipeline to develop commercially available biotech crops. We also aim to enhance national food security and to turn agriculture into a major national leading industry by utilizing these technological pipelines. To achieve this goal, we have developed various GM crops. We have been developing GM crops that have been enhanced by agricultural useful traits as well as those that can be used as high value-added industrial materials. As mentioned earlier, the crops are being developed taking into account safety and practical effects in order to secure future commercially available GM events. A particular concern in developing a qualified event is the actual effect of the developed GM crop. In many cases, GM crops developed appear to improve their targeted traits in the laboratory or in the greenhouse condition, but many field trials experience insufficient effects. In addition, in many cases, non-target agricultural traits of the developed GM crop are significantly distinguished from its conventional variety, which may be a decisive reason for failure in the safety regulatory process (Slot et al. 2018). For this reason, we have developed GM crops with a focus on safety regulations and practical effects. As shown in Table 1, over the next seven years, 81 GM crop events from 13 crops have been developed based on the above-mentioned considerations and guidelines (Park 2014; Lim et al. 2016; Park 2017). Biotic stress resistant crops were developed such as insect resistant Chinese cabbage, pest resistant rice, cucumber mosaic virus (CMV) resistant GM red pepper, viroid resistant chrysanthemum, and so on as shown in Figs. 1 and 2. They showed effect of less pesticides and preventing loss of yields in field trials, meaning that they could be used as useful breeding materials for eco-friendly farming (Lee et al. 2009; Park 2014; Jo et al. 2015; Lee 2015). For preparing future climate change, drought tolerant crops including rice, soybean, and Chinese cabbage were developed as shown in Fig. 3. Drought tolerant GM rice showed 15–20% more yield under drought condition compare to sensitive control rice variety (Cho et al. 2014; Kim et al. 2015; Siddiqui et al. 2015). We have also developed GM crops that increase value by improving quality or by adding novel functions. For example, high-value GM rice events have also been developed to increase consumption of rice, such as rice containing high mineral, golden rice producing carotene (a precursor of pro-vitamin A), GM rice to help prevent diabetes, and so on. In addition, various high-value GM crops that could be used as a bio-factory for producing raw materials of pharmaceuticals and cosmeceuticals also were developed. Tobacco plant that produces animal vaccine, resveratrol-enriched rice, soybeans that produce functional proteins were developed and the function was confirmed through animal testing. In case of resveratrol, there are many reports about its effect for cutting the risk of human diseases including heart disease, cancer, diabetes, and so on. Result of animal feeding test showed that resveratrol-enrich GM rice have effects for the treatment of metabolic syndrome and related diseases, and also preventing skin aging (Baek et al. 2013; Baek et al. 2014; Lee et al. 2014; Subedi et al. 2017). This result indicates that rice could be used not only as staple food but also as high value industrial materials for pharmaceuticals or cosmeceuticals. Further researches are being carried out at the Agricultural Biotechnology Research Center, which was launched in 2118 to confirm functions and safety required for their future use (Park 2014, 2017). Objective of risk assessment is to identify and evaluate the potential risk and adverse effects to confirm food & environment safety of genetically modified organism (GMO). For food safety, molecular biological characteristics, compositional analyses of key nutrients, possible toxicity, possible allergenity, and so on should be assessed. For environmental safety, molecular biological characteristics, unintended effects, potential of gene flow, weediness potential, and adverse effects on non-target organisms and so on should be assessed. Table 2 shows check points for regulatory approval which should be confirmed in safety assessment (Harrigan 2014). Based on OECD and FAO/WHO guideline, the safety assessment of GM plants follows a comparative approach in concept of substantial equivalence. In other word, starting point of safety assessment is to identify similarities and differences between the new GM plant and its conventional non-GM variety. For this reason, newly developed GM crops are compared with their conventional non-GM varieties in order to identify intended and unintended differences which subsequently are assessed with respect to their potential impact on the environment and safety for humans (EFSA GMO Panel 2008). The research teams involved in our program conducted safety assessments for 10 GM crops (events) over the last seven years from 2011, in accordance with the above guidelines. As Table 3 shows, the GM crops are drought-tolerant rice, insect resistant rice, resveratrol-enriched rice, rice stem cell containing high resveratrol, virus resistant pepper, three soybean plants producing functional proteins for cosmetic materials, and two herbicide tolerant grasses (Bae et al. 2008; Bae et al. 2011, Lee et al. 2011; Park 2014; Park 2017). Among them, the herbicide tolerant grass with male-sterility developed by a research team in Jeju National University is currently reviewing its safety by a safety regulatory agency in Korea whether to approve the use of it for commercial purposes. As shown in Fig. 4, rice stem cell containing high resveratrol developed by a domestic bio-company was approved in January 2018 for production of resveratrol as an industrial material only in isolation facilities. As mentioned, resveratrol has many clinical human health benefits. Since GM rice has helped treat metabolic syndrome and showed an anti-aging effect, we expect it to be used in high-value industrial materials. These high-value GM crops are expected to benefit both producers and consumers by increasing consumption of crops and contributing to improving human health (Baek et al. 2014; Lee et al. 2014; Park 2014; Park 2017). For the past seven years, we have been working to establish a technology pipeline for the development of biotech crops. As a result, a technical platform was established for the development of commercially available biotech crops. Using this technology platform, we developed various useful GM crops that not only enhanced agricultural properties but also enhanced value with new functions. They may be used in the future as useful breeding materials or as materials for high value-added bio industrial. More significantly, safety assessment for newly developed GM crops revealed that they show any difference compare to conventional non-GM varieties. These results mean that biotechnology crops are safe enough to meet consumer’s needs through commercialization or address adverse situations such as climate change. This work was supported by a grant from the Next-Generation Bio-Green 21 Program (No. PJ01367503), Rural Development Administration, Republic of Korea. Our authors are also truly grateful to all the researchers who participated in this program. Fig. 1. Difference in virus resistance between GM peppers and non-GM peppers in CMV infection conditions. Fig. 2. 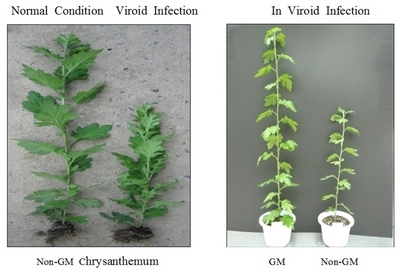 Difference in viroid resistance between GM chrysanthemum and non-GM chrysanthemum. Fig. 3. 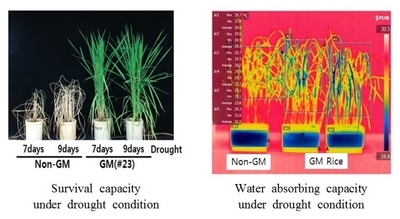 Phenotype and physiological difference in drought tolerance between GM rice and non-GM rice. Fig. 4. Rice stem cells approved for commercialization to produce resveratrol as an industrial material only in isolation facilities. GM crops (events) developed through the NCGC program. Regulatory approvals utilize a weight-of-evidence approach based on extensive product characterization. Supplementary on a case-by-case basis. Safety assessment completed GM crops (events). Baek, SH, Chung, HJ, Lee, HK, D’Souza, R, Jeon, YG, and Kim, HJ (2014). Treatment of obesity with the resveratrol-enriched rice DJ-526. Sci Rep. 4, 3879. Baek, SH, Shin, WC, Ryu, HS, Lee, DW, Moon, EJ, and Seo, CS (2013). Creation of resveratrol-enriched rice for the treatment of metabolic syndrome and related diseases. PLoS One. 8, e57930. Bae, TW, Vanjildorj, E, Song, SY, Nishiguchi, S, Yang, SS, and Song, IJ (2008). Environmental risk assessment of genetically engineered herbicide-tolerant Zoysia japonica. J Environ Qual. 37, 207-218. Bae, TW, Kang, HG, Song, IJ, Sun, HJ, Ko, SM, and Song, PS (2011). Environmental risk assessment of genetically modified herbicide-tolerant zoysiagrass (Event: Jeju Green21). J Plant Biotechnol. 38, 105-116. Cho, JI, Lim, HM, Siddiqui, ZS, Park, SH, Kim, AR, and Kwon, TR (2014). Over-expression of PsGPD, a mushroom glyceraldehyde-3-phosphate dehydrogenase gene, enhances salt tolerance in rice plants. Biotechnol Lett. 36, 1641-1648. EFSA GMO Panel (2008). Safety and nutritional assessment of GM plants and derived food and feed: The role of animal feeding trials. Food Chem Toxicol. 46, S2-S70. Harrigan, GG 2014. GM Safety and Crop Composition., Workshop for Understanding and Application of Metabolomics to Biotech Crop., July. 1st, 2014, Seoul, Korea. Jo, KM, Jo, Y, Choi, H, Chu, H, Lian, S, and Yoon, JY (2015). Development of genetically modified chrysanthemums resistant to Chrysanthemum stunt viroid using sense and antisense RNAs. Sci Hortic. 195, 17-24. Kim, AR, Lim, H, Cho, JI, Kim, CK, Ji, SU, and Park, SC (2015). Overexpression of BrTSR53 gene improves tolerance of rice plant to salt stress. Plant Breed Biotech. 3, 376-383. Kim, CG, Jeong, SC, Yoon, WK, Park, KW, Choi, KH, and Kim, HM (2009). Development of genetically modified crops based on considerations of risk assessment and management. J Plant Biotechnol. 36, 360-365. Lee, SW (2011). Strategies for the development of GM crops in accordance with the environmental risk assessment (I). J Plant Biotechnol. 38, 125-129. Lee, TH, Seo, JO, Do, MH, Ji, E, Baek, SH, and Kim, SY (2014). Resveratrol-enriched rice down-regulates melanin synthesis in UVB-induced guinea pigs epidermal skin tissue. Biomol Ther. 22, 431-437. Lee, YE, Yang, SH, Bae, TW, Kang, HG, Lim, PO, and Lee, HY (2011). Effects of field-grown genetically modified Zoysia grass on bacterial community structure. J Microbiol Biotechnol. 21, 333-340. Lee, YH, Jung, M, Shin, SH, Lee, JH, Choi, SH, and Her, NH (2009). Transgenic peppers that are highly tolerant to a new CMV pathotype. Plant Cell Rep. 28, 223-232. Lim, H, Hwang, HJ, Kim, AR, Cho, MH, Ji, HS, and Kim, CK (2016). A simple, rapid and systematic method for the developed GM rice analysis. Plant Biotechnol Rep. 10, 25-33. Siddiqui, ZS, Cho, JI, Park, DB, Lee, GS, Ryu, TH, and Shahid, H (2015). Field assessment of CaMsrB2 transgenic lines in a drought stress environment. Turk J Bot. 39, 973-981. Slot, MM, van de Wiel, CCM, Kleter, GA, Visser, RGF, and Kok, EJ (2018). The assessment of field trials in GMO research around the world and their possible integration in field trials for variety registration. Transgenic Res. 27, 321-329. Subedi, L, Lee, TH, Wahedi, HM, Baek, SH, and Kim, SY (Array). Resveratrol-enriched rice attenuates UVB-ROS-induced skin aging via downregulation of inflammatory cascades. Oxid Med Cell Longev, 8379539.